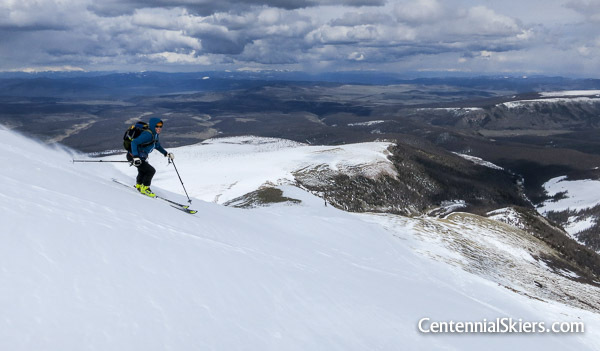 One of the many things we’ve learned through the years of skiing Colorado mountains is that it’s wrong to assume only technical peaks present challenges. 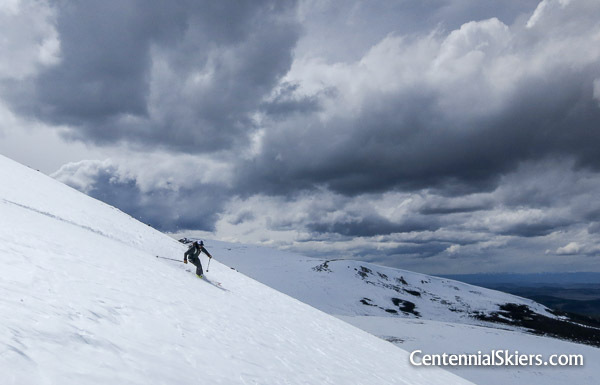 Once in a while a straight-up easy mountain can really put up a fight. That was the case with Stewart yesterday, a mountain considered to be an easy day-hike in the summer, but one that’s remote and difficult to access this time of year. This was our second attempt here, which in itself speaks to Stewart’s challenges. 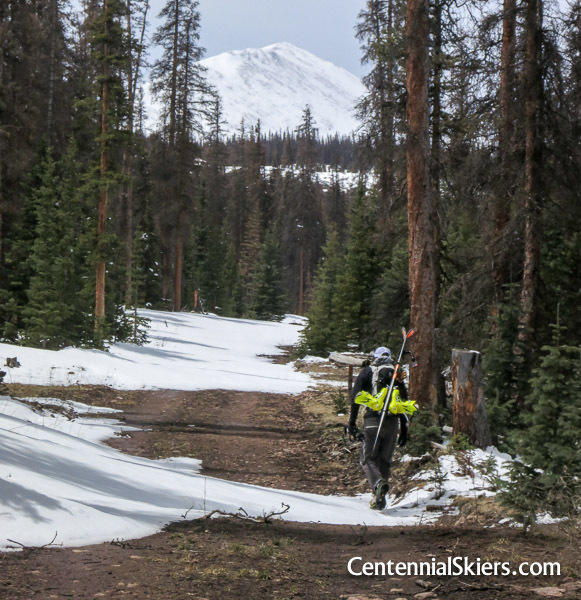 Earlier in the spring we made an overnight trip from the south, where our travel was stymied by the combination of thin snow cover and excessive deadfall from the bark beetle infestation. We had to turn back. We made plans to return via the north later in May, in hopes that 1) the area would get more snow, and 2) that the route would be easier. We got the snow, but it actually made our route harder, certainly longer. 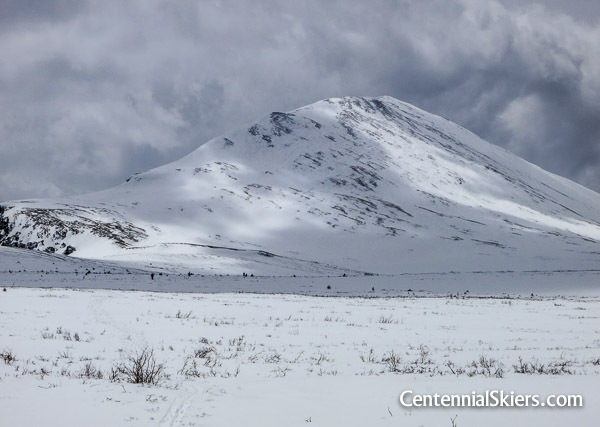 The late April and May snowstorms improved our prospects for skiing Stewart, but with all that precipitation came a delay in the opening of the access roads needed to get to the mountain. Since our schedules only allowed a small window to go to Stewart as a group, we couldn’t wait for the road to open. We would have to cover the added distance on bikes. 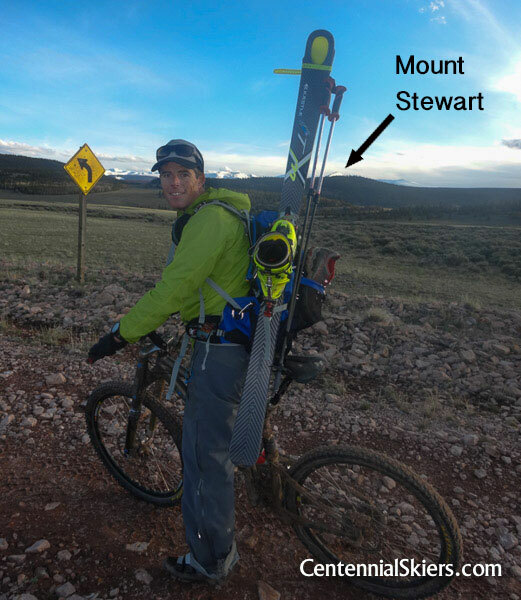 Stewart would be a 35 mile roundtrip day. It was that or wait until next year. Chris’s video sums it up below. The first leg was the toughest. We rode our bikes about 12 miles, gaining 2000 vertical feet along the way. 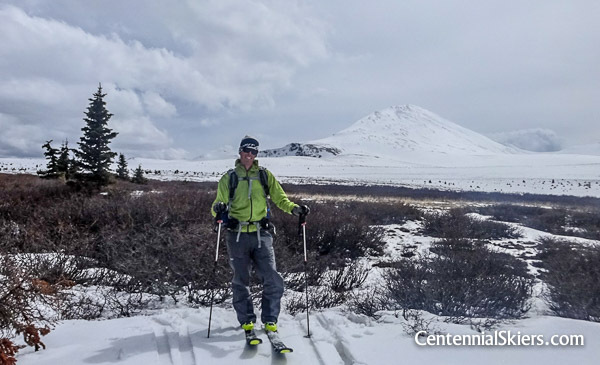 Skis, boots, avy gear, skins, water, food, extra layers— upwards of 20 lbs.— were on our backs as we rode. Since the road was so wet the surface was very muddy, and at times it was so soft and slick we couldn’t pedal through it. Gears clogged, and when things angled uphill we were often relegated to walking our bikes. So we rode. One of the drier stretches here, with Stewart out in the distance. Still a long way to go. After nearly five hours of riding and walking, we reached a point where we could finally ditch the bikes. We were pretty worked. It felt like a full day’s effort yet we were still miles from the mountain. From there we hiked through mud and snow, and then continued on skis and skins over snow, rocks, dirt, and fallen trees. The snow was isothermic and punchy as we skinned, with a lot of “trapdoor” hollowness as we made out way through endless willows. 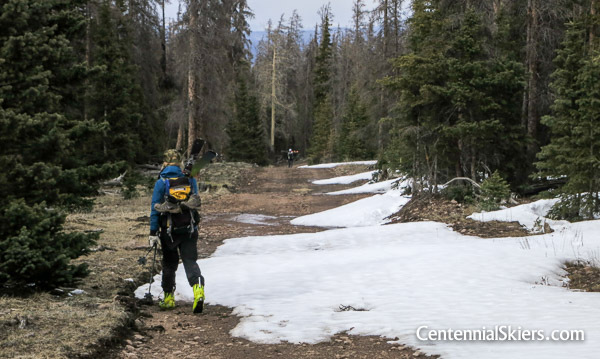 We broke treeline and traversed Willow Mesa for what felt like miles, and at some point along the way some of our skins began to ball up with snow. We pressed on as we climbed over the three false summits to the top. We made it. And we hiked. Stewart still looks far away. And we skinned, here across Willow Mesa. Stewart, still not that close, now almost seven hours in. A tiny Chris and Christy are out in the flats. Skinning up to the ridge. It took a while but we finally felt like we were actually on the mountain. It was grey and windy, we were 17 miles from the car and it was 3pm, but we couldn’t have been happier. Stewart was no gimme, this so called “easy peak” really threw a lot at us. But it’s the hard days like this one that we’ll remember the most. We collected ourselves, took the requisite summit shot, pulled skins, and began the long trip back. 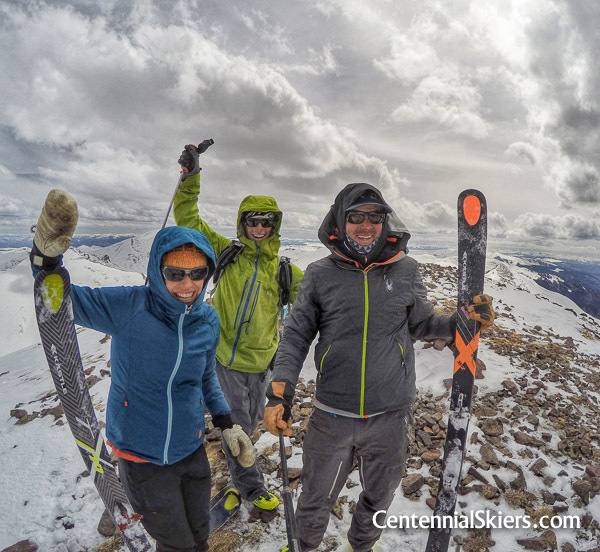 Skins off, skis on, and we made our way back down the Northeast Ridge we ascended. Chris, in one of the few sections of OK snow. And then back on our feet, and eventually, back on the bike. Sparing all the details of the return trip, we basically reversed course and made it back to the truck just as the sun set over the horizon. Thankfully the road had dried out a bit since the morning, so the road was more firm for the ride out. 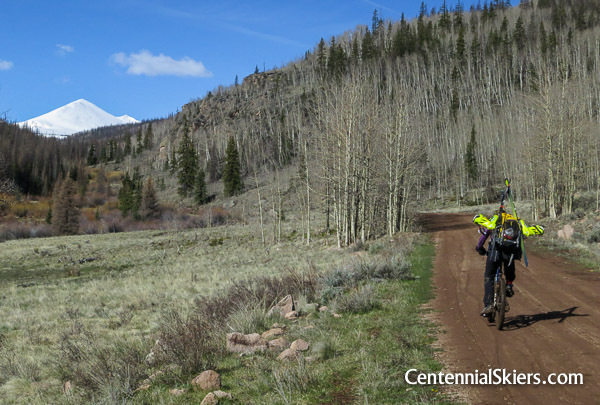 And with that, the Stewart sufferfest was complete, Centennial Peak #99. We’ll put three more checks in the column to the right. Almost to the truck at dusk, you can see just how far away the mountain really is. In one regard we were really just making memories out here today. Next up, Jagged. 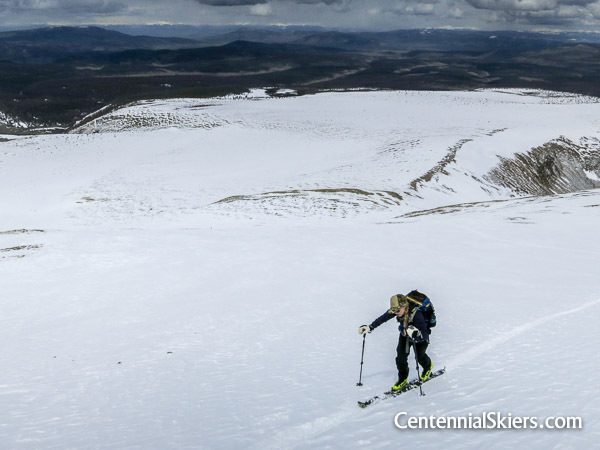 We’re going to head back to the Weminuche next week and try for #100. Stay tuned.